A book chronicling the historic drama that took place in CAL Bank in 2008 between the founder, Afare Donkor and management has been launched. Ebenezer Amankwah, the author of the book, said it was inspired by the shocking resolutions which Afare Donkor made at an Emergency General Meeting (EGM) of the bank in 2008. 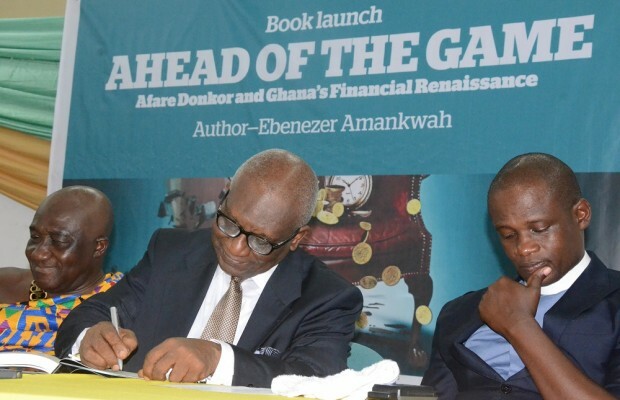 Mr Amankwah, who was speaking at the launch of the book titled, ‘Ahead of the Game: Afare Donkor and Ghana’s Financial Renaissance,’ in Accra on Thursday, said the EGM, which resulted in court cases and other legal tussles was the highpoint of the book. In 2008, corporate Ghana was held spellbound when the founder of CAL Bank, Mr Donkor requisitioned an Emergency General Meeting of the bank with shocking resolutions. That single act sparked a series of actions and reactions including a block trade on the Stock Exchange that led to intense criticism of the Bank of Ghana (BoG). “Among his resolutions at the EGM was to sack the Managing Director and that was a daring audacious move that nobody had ever tried before. That EGM and the things that transpired inspired the writing of this book. The book also traces Afare Donkor’s entire career from his early beginnings,” he told Nii Ogbamey Tetteh. The book also touches the exploits of Afare Donkor, tracing his innovation in forming Consolidated Discount House (CDH) and Securities Discount Company (SDC). His integral contribution to the establishment of Ghana Leasing Company and the Ghana Stock Exchange (GSE) are all told in vivid detail. There’s also the interesting role he played in the setting up of Databank Financial Services and his elevation in 2002 to the role of Ghana’s Ambassador to China in the President Kufuor administration. Mr Amankwah, who is also the Corporate Communications Manager at Vodafone Ghana, urged the youth to work hard in order to survive in the business community. The 240-page book, which was reviewed by ace broadcaster Kweku Sakyi Addo at the event, was published by Sedgewick Publishers. “A lot has changed from Afare’s time but I think that is why the book is there. One can make the atmosphere and environment conducive for one to achieve what he did because it wasn’t possible at his time but he was still ahead of the game then and he did it,” he said. Nana Addo Dankwa Akufo–Addo, Presidential Candidate of the New Patriotic Party (NPP), who wrote the foreword of the book, disclosed that Afare Donkor has contributed immensely to the advancement of this country. “In the financial services sector of which he stood as an inventor and visionary and even the diplomatic field whiles as Ghana’s Ambassador to the people’s Republic of China under President Kufuor, he helped promote important initiatives in the relations between the two countries,” Nana Akufo-Addo noted. A large number of corporate and political bigwigs like Elizabeth Ohene, Fred Oware, Nana Akwesi Abayie, Ken Ofori-Atta, Gayheart Mensah and Ace Ankomah, among others, attended the event.